Oh cool, terrific shots! That first photo is excellent, rainbows, droplets, reflections! I so love this whole poem...images and all. It just flowed through me...and I immeresed myself in all the words you used to describe connection..holding...but then the blessed release of letting go. 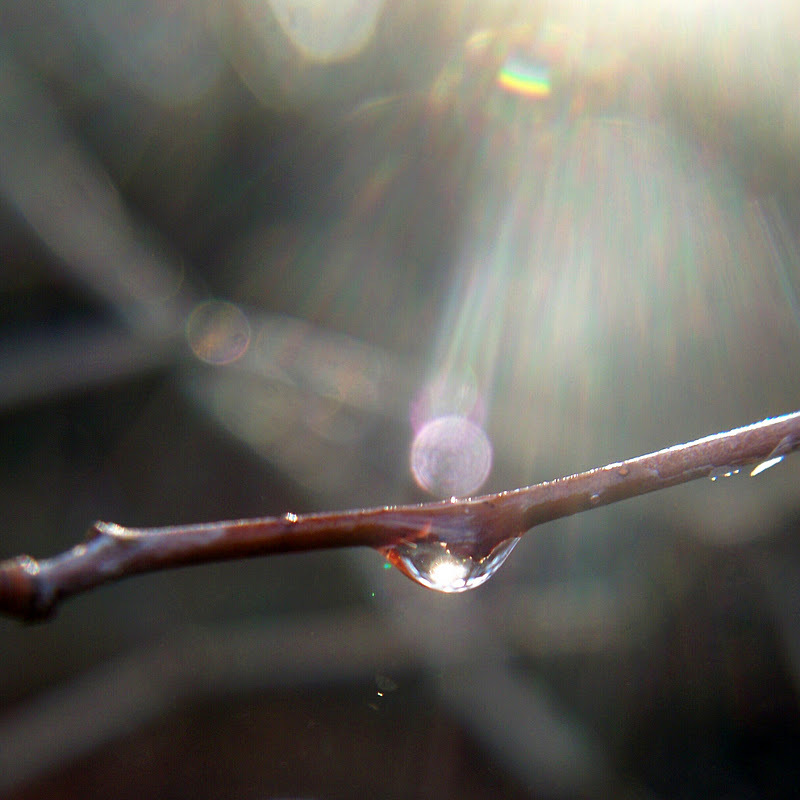 Love how the light is shining around the raindrop in the first photo. 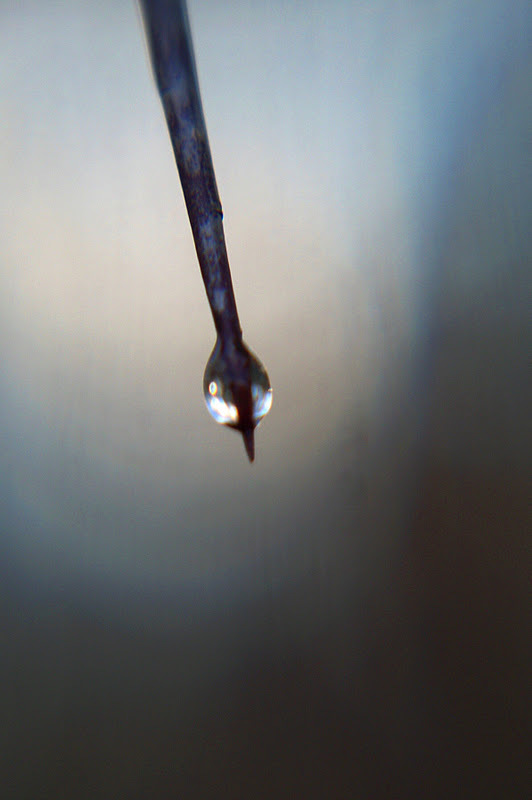 And the photo of the thorn and raindrop is stunning. You have such a nice way with words and the camera. I always enjoy stopping by your blog. Oh, Laura! As I finished this, I felt a chill go up my spine and I started crying. To me, this piece speaks of our deep connection to the Divine and the strong faith it takes to let go of ego-based thinking and to trust in all that is with grateful acceptance, "a trusting release into the expansive IS-ness of being." Your words are guided by Spirit. Thank you! Wow - these shots are magical. That first one is heavenly! Great macros, thanks for sharing! What a great gift you have Laura, thank you for sharing it. Love this word, Love this post. Thanks for sharing your understanding. Lovely words and photos. 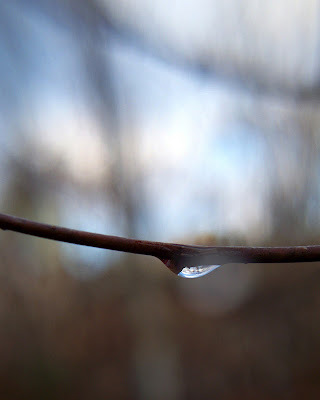 I love waterdrop photo's like this. Such beautiful shots and poem Laura! Inspiring words and fantastic shots. i think to cling to Him is a sort of leap into the unknown, sometimes... such a beautiful illustration with your photos. That first one is magical! It is so nice to meet you Laura, and welcome to The Creative Exchange. This is a beautiful series of images. I love the simplicity in each of them. Absolutely gorgeous shots! Thank you! Beaufiful images and words. Thanks for following my blog, hope to hear from you sometime. Gorgeous details and light in these images, Laura. Just beautiful, Laura. What a wonderful way to illustrate such thoughts. Beautiful, absolutely beautiful and stunning!!!! I love your photo work very, very much. This is so poetic and lyrical. I love this wonderful softness and gentleness! Amazing. And words are so inspiring and touching. Hi there - I think that I may have to try some of these water drop shots - they look great. Plagiarism being the sincerest form of flattery! 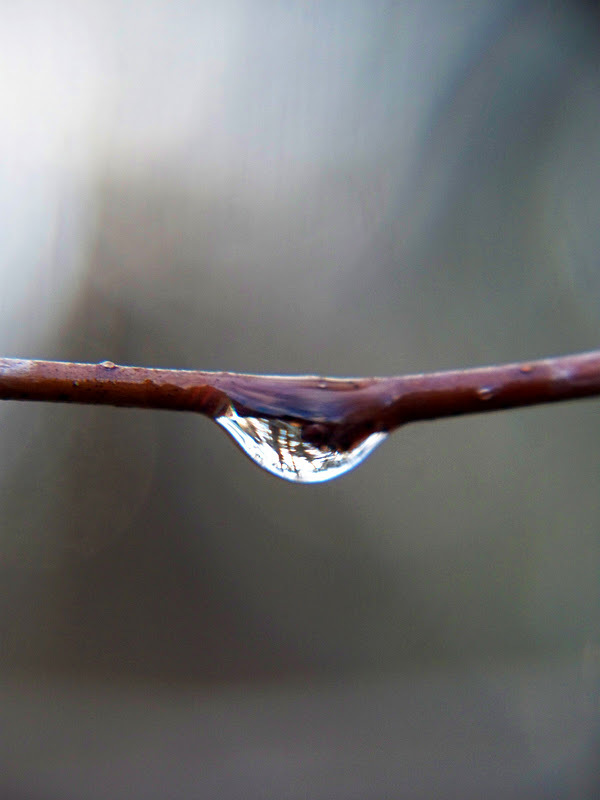 I love that drop of water, she is a lifetime, beautiful photos. Lovely water droplets and the light in your first picture is wonderful. Thanks so much for visiting my blog and leaving such a great comment! You have such a wonderful blog here! This is an aesthetic treat! I love the varying perspectives. That first image is AMAZING!!!!! Is this your original photography? I love it!!! Great piece and wonderful pictures. Wonderful shots and great little bit of verse to go along with them, nicely done! I love the combo of photos and poem here--just so very beautifully expressive! the attaching, the clinging...so beautifully penned and underlined with the pic..just perfect together..
love these images, both word and photos! but you made me laugh anyway. You inspire me each time I come here friend. And so now, a gift to you - on my blog. Lovely mediations -- both in words and photos -- upon the many levels of the Hebrew concept of Devekut, connectedness with the Divine. Thank you for this inspirational read! What a magical discovery of divine images and words! Found you over at our wonderful friend Kristen’s place. A wonderful post. Beautiful work, my friend. Always always the deepest level of beauty and inspiration here Laura. You always make me cry with your poems and posts, Laura. You release something in me that I have stuffed far down...life, you know. Expansive is-ness of being.. I could relate to that and the words and images are so lovely... thanks for sharing..